When should we start teaching our children about business? For me, you can’t start too early because businesses have the power to transform economies, create opportunities and impact lives. So the earlier we can start them on this continual journey of understanding, the better. Because it doesn’t matter how successful you are in business, you’re always learning. So it makes sense that we should start that journey of learning and discovery and failure and success as early as possible. 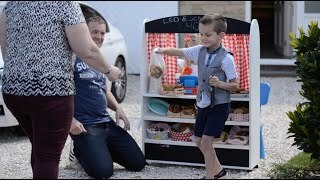 So this is the Cookie Stall project I did with my children – Leo & Scarlett – to introduce them to certain aspects of business. We covered advertising, marketing, buying, manufacture, selling, making a profit and finally one of the most important aspects of business for me….. contribution. This is because we used the project as an opportunity to raise funds for a boy in Scarlett’s class called Thomas who has problems with his limbs. This means he is unable to ride a conventional bike and so we gave him the money we generated to go towards it. There are some valuable lessons in here for all of us and it would be great to hear your thoughts and comments. And maybe between us, we can create the next generation of business pioneers who make a positive difference and contribution to the world in which we live.